Electric Tramway Society (NETS) will have fun activities, historical information and Trolley Barn Museum tour. NETS have been seasonally operating the original Nelson trolley, Streetcar #23, on a symbolic route along Kootenay Lake’s majestic waterfront for over 25 years. The society is completely run by volunteers from maintenance, to engineering to conducting and driving. This social enterprise strives to be self-sufficient, but costs of running a 110-year-old trolley can add up. That is why NETS is extremely excited about the Canada Day partnership they have with the Nelson and District Credit Union (NDCU) to pay the fares for all riders on July 1st. 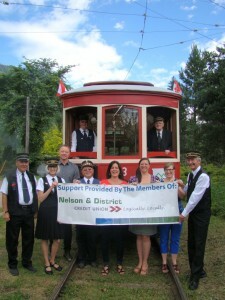 The NDCU recognize the significance of having StreetCar#23 as an attraction in Nelson. It provides another reason for people to visit this beautiful region; it is a destination experience for enthusiasts and fun activity for the entire family. NETS also provide volunteer opportunities for people to stay active and contribute to the continuing growth and beauty of the community. This could not be done without the assistance from the local community and specifically the Nelson and District Credit Union who have been a big supporter and continue their tradition by paying all the fares for July 1st so everyone rides for free on Canada Day. “We are very lucky to have the NDCU helping us, it is with contributions from local organizations that help keep the Trolley alive and we really appreciate the continued support the Credit Union provides.” Says Chris Holland Motorman #106. If you would like find out more or become a member of the Nelson Electric Tramway Society drop by the Trolley Barn Museum next to the soccer fields on July 1st. You can also reach them at 250.352.7672 or www.Nelsonstreetcar.org . This entry was posted in Uncategorized by NETS. Bookmark the permalink.